This 5-ingredient Tomato, Feta and Vidalia Onion Salad recipe is my go-to side dish for summer BBQs and potlucks! I found this recipe for Tomato, Feta and Vidalia Onion Salad in Cooking Light a number of years ago. It was one of those side dish suggestions buried in the sidebar of an actual recipe. I can’t even remember why it caught my eye, but thank goodness it did because I’ve been making it ever since. Hands down, this Tomato, Feta and Vidalia Onion Salad is my go-to side dish to prepare during summer. It’s super easy to throw together, and it goes with nearly any meal from humble burgers and brats to fancy steaks and salmon. I’m telling you, put this in your recipe rotation, and you’ll marvel at its versatility – and deliciousness. 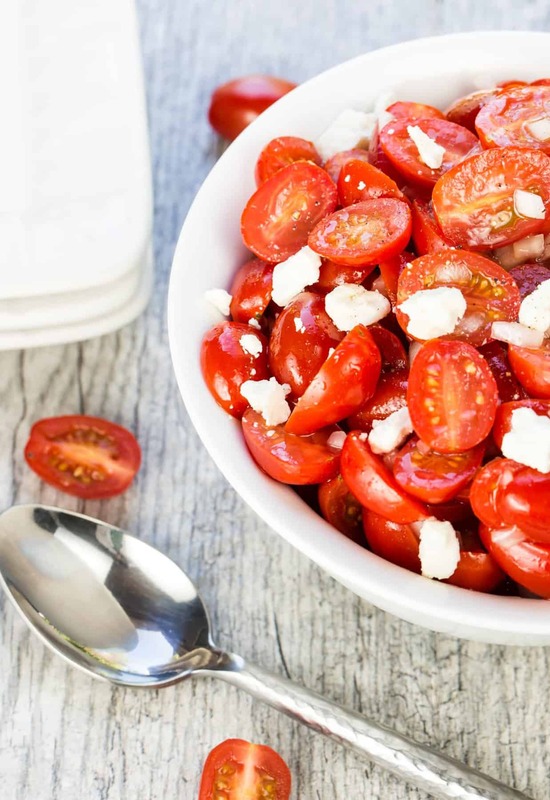 Clearly you have to like tomatoes to enjoy this recipe, but I think the combination of juicy tomatoes, salty feta and sweet onion (balanced with a little oil and vinegar) is swoon-worthy, especially when tomatoes are at their peak. I’ve also made it with grocery store grape tomatoes since our growing season is so short in Minnesota, and it’s still rock solid. 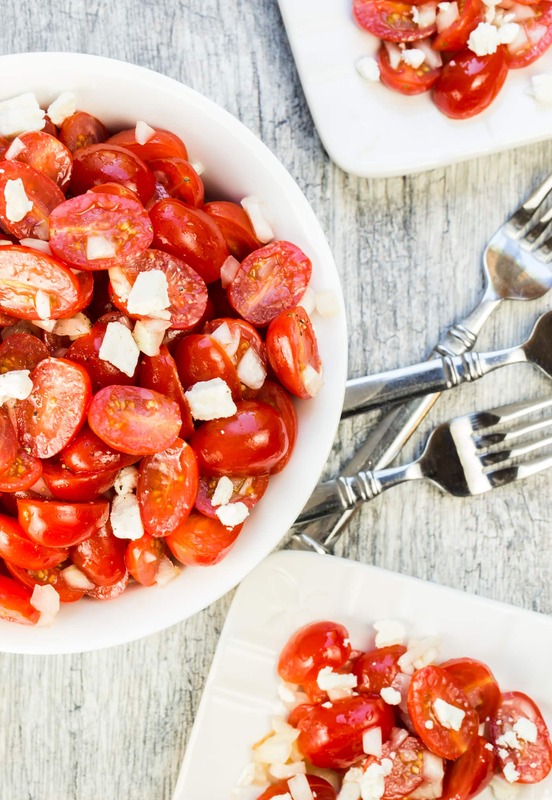 Tip: Making this Tomato, Feta and Vidalia Onion Salad ahead of time? Combine all ingredients except the cheese and refrigerate. Stir in the feta right before serving for the best presentation. Looking for more summer side dishes? We’ve got ’em! Place tomatoes and onion in a bowl. Whisk together vinegar and oil and pour over tomato and onions. Stir to combine. Sprinkle with feta cheese and gently fold into tomato mixture. Add salt and pepper to taste. I love tomatoes in the summer! I have been waiting for this time of year because they just don’t taste as good the rest of the year. My farmers market opens this weekend and I can’t wait to buy some tomatoes and make this salad. It looks delicious. Nothing beats those summer tomatoes! These are the kind of simple, fresh, flavorful dishes I LIVE for in the summer! Lovely recipe, Anna! I’m with you, Georgia. Bring on the bounty of summer! I just love this easy salad! And it’s gorgeous, too!